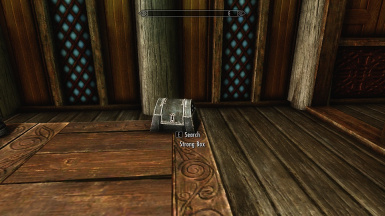 A small cheat item for those who do not wish to spend a couple of minutes doing the alchemy enchanting loop. Now with 33% more gold. 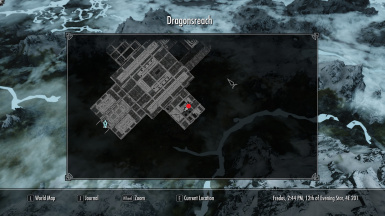 SSE Version can be found here -> https://www.nexusmods.com/skyrimspecialedition/mods/14215/? We now have a new version, 1.2. Awesome right, it's been a bit overdue but here it is guys. We have 4 rings now, and they're all in one nice little esp. No need to worry about finding if you can have the 100% version but want to keep the 1000% version. However, if you have a mod older than 1.2, you MUST follow the uninstall guide for your respective method. I've actually tried to see what happens and it involves buggyness with new rings, glitching and random crashing (Guaranteed crashing with bound sword). A small cheat item for those who do not wish to spend a couple of minutes doing the alchemy enchanting loop. You create a fortify enchanting potion to increase the fortify Alchemy enchantment and then making an even stronger fortify enchanting potion. Repeating this process will increase the enchanted items to a very high level. You repeat the process as many times as desired and thus the loop has started. This mod adds a unique ring. 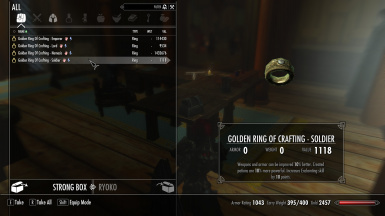 The ring Fortifies Enchanting, Alchemy and Smithing by a set amount. Comes in 3 4 Flavors. All Rings are now combined into the one esp. 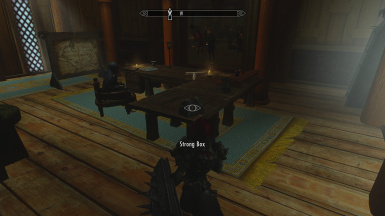 Dragonsreach, on the table near the enchanting and alchemy altars. 1 - UNEQUIP ANY GOLDEN CRAFT RING!!!!! 2 - Deactivate the esp in NMM. I originally made this as I was too lazy to do the alchemy enchanting loop and figured that many others are too. However, You could also use said ring as a stepping stone for even larger smiting or enchanting numbers. Now go forth and slay some dragons.